The Ordesa/Monte Perdido National Park (and World Heritage Site) is walkers' heaven and undoubtedly boasts some of the Pyrenees' finest walking. These wild highlands climb up to the crazed and broken high ridge that separates Spain from France, with extraordinarily deep and dramatic canyons and gorges gouged to the south and east and great peaks to bag and clos to gain. Huge cliffs, fine animal life and gloriously rich and varied forests lower down. This walking is in high, remote mountains. Come prepared. The relatively small Ordesa/Monte Perdido National Park (and World Heritage Site) is walkers' heaven and undoubtedly boasts some of the Pyrenees' finest walking, an area of wild, glacially ground, highlands climbing up to the crazed and broken high ridge that separates Spain from France, with extraordinarily deep and dramatic canyons and gorges gouged out of the prevailing limestone to the south and east. 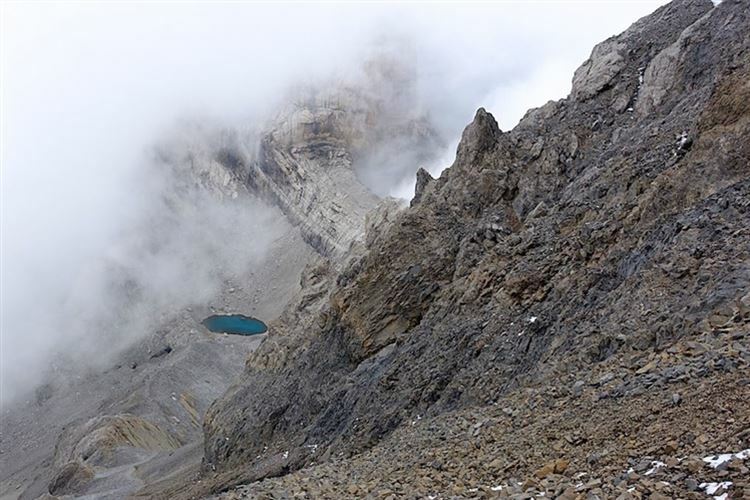 The high ridge includes the range's second-highest mountain, the walkable Monte Perdido (Mont Perdu), and that famous slice out of the vast cliffs that form the frontier, the Breche de Roland (and see the ice-choked Marboré caves). The middle ground is relatively level plateau, a sparse semi-desert with crunching slate fragments and limestone pavements alternating with soft and verdant meadows underfoot. Gouged into this softish rock are three great holes, the Ordesa and Aňisclo canyons and (technically outside the park) the lovely Pineta valley. The Ordesa Canyon is a 15km (or so) long, extraordinarily evenly proportioned glacial gouge running pretty well straight for much of its length through the prevailing limestone, in place 1,000m deep and lined on both sides with huge and dramatic cliffs. It truly is a majestic and inspiring sight, from all angles. See more information on Ordesa here. The Aňisclo Canyon to the east is a very different but still extraordinarily dramatic place, a narrower, water-carved hole with a perfect stream chuckling its way (on a good day) between towering cliffs, amid very delightful greenery, a very secret and verdant domain amid the sere highlands. It is much loved by walkers. The lovely and very different Pineta Valley lies further to the east of and technically outside the park. It climbs north-west, right up to the north great Monte Perdido, which it gets on for cutting off from the rest of the highlands, with the vast cliffs and crags of the high border ridge immediately to its north. You can approach the valley by road from the east. 1,000m above to the west and right under Monte Perdido is the spectacular upper valley known as the Balcon de Pineta. The interiors of the canyons/valleys are very different worlds, even from each other. The Ordesa is a mix of grassland and lonely pines at its top end and pine forests carpeted with ravishing vegetation and interspersed with lovely mixed deciduous woodland, which becomes predominant lower down. The Aňisclo Canyon is different again, a much narrower and in places near-slot canyon between huge and light-obscuring cliffs with delightful and at times dank-world greenery crowding every available ledge. Pineta is nearer a regular Alpine valley than Ordesa or Aňisclo, wide with meadow and pine in its lower reaches but bare and craggy at its top. Wildlife includes sorrios (chamois) and 31 other mammals species as well as a huge selection of birds. The vegetation is famously varied, with a huge selection of specialized highland plants to admire. 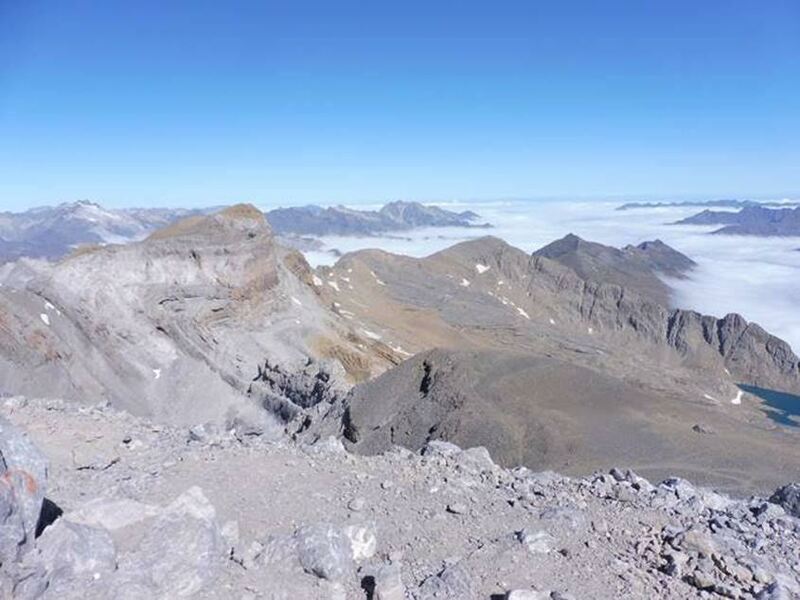 Walking options include walking the canyons/valleys, exploring the upper areas, bagging peaks such as Monte Perdido peering into France through the Breche de Roland, and heading off on bigger circuits altogether, including the Gavarnie/OrdesaCircuit, one of our Top 100 walks. Canyon exploration can be done from the nearby towns and villages, but, to get deep into the really wild upper areas, you need to plan to spend at least one night in a refuge. The Ordesa Canyon has an outstanding selection of walks, including a fine trail (a section of the great GR11 route) follows the length of the canyon bottom, right up to the great waterfall at its head and the remarkable Faja de Pelay, which follows a balcony in the upper cliffs, with a well-planned switchback descent. Spectacular, dramatic, magnificent, thrilling, awe-inspiring: those overused words really do apply here. There are superb walks along both rims of the Ordesa. You can walk down or up the Aňisclo Canyon in 6+ hours, although there are all sorts of ways you can tackle it (or its parts). This can be demanding walking. The Pineta valley has a fine selection of walks, including in and above the Balcon de Pineta, whence you can climb Monte P (a huge walk if not via a night in the Goriz refuge), and heading up the Llanos de Larri side-valley to the north. You can cross to Goriz and the Ordesa and Aňisclo canyons or even cross due north into the superb Cirque d'Estaubé in France, and thence via a high col to Gavarnie. Between Pineta and Aňisclo is the extraordinarily narrow and deep almost-slot canyon of Escuain, much less visited but with some giddy party on its upper flanks. Highland walks around the rims of the Ordesa Canyon include both northern and southern options. The northern options are a long way from civilization and are best accessed after a night in the Rifugio de Goriz - but are varied and empty. A climb or circuit round 2,769m Punta Tobacor high above the north rim looks particularly appealing. The relatively flat southern rim's routes are manifold, with views back across the canyon to the high peaks of the border ridge, and can be accessed from Goriz or from high roadheads at Fanlo and Nerin, or for the masochists from much lower near Torla. The Pico de Enmedio (at 2,133m), with five different approaches, is a natural target. Other classic high walks include crossing between Goriz and the Aňisclo Canyon or Pineta valley, over high passed on trails that command some truly remarkable views both down onto the canyons/valleys (and the great gouge that is Aňisclo in particular) and up to the ever-present high ridge. (An occupational hazard of being Walkopedia is being thought hyperbolic: but we aren't, this is all as we proclaim!) You can create a variety of multi-day walks crossing between canyon/valley systems or spending one or more happy days walking from the Goriz refugio, perhaps climbing Mont Perdu/Monte Perdido, the third-highest peak in the entire range, or getting to look down into Aňisclo and Pineta, or teetering on the north or south rims of Ordesa as mentioned above. 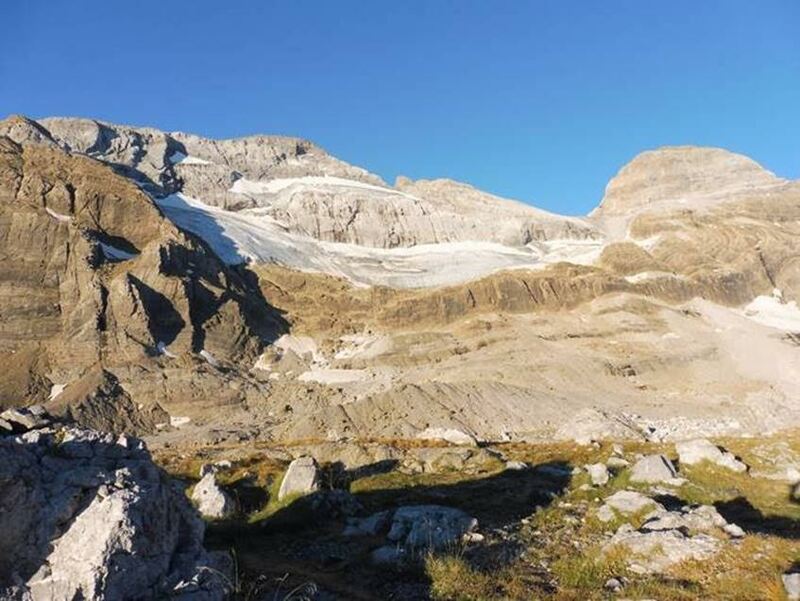 The prime peak to bag would be Monte Perdido, the third highest in the entire range at 3,355m, a long, tough slog and scramble from (usually) Goriz but which rewards with outstanding views in all directions. The ridge west of the Breche de Roland is also justly popular. But there are plenty of summits to choose from. Expect rain at any time, although you will be unlucky not to get some gorgeous clear days in summer and early Autumn. Severe Summer thunderstorms are a regular feature which require immediate descent away from maximum exposed areas, and Summer is often very hot. Snow lies late, with the high range only really clear by mid July. Parts of the Ordesa Canyon heave with tourists in high summer, and many day walks are busy at that time. So, come prepared to tolerate. You can base yourself at or near the pleasant Torla to the south of the canyon's bottom. In the high ground, accommodation comes down to the refuges and some camping - although they get busy (Goriz is said to be the busiest in the Pyrenees), so book well ahead if coming in the popular months. Camping is restricted to over 2,100m and by the refuges. SEE OUR SPANISH PYRENEES PAGE FOR PRACTICAL AND GENERAL INFORMATION AND MORE PHOTOS.